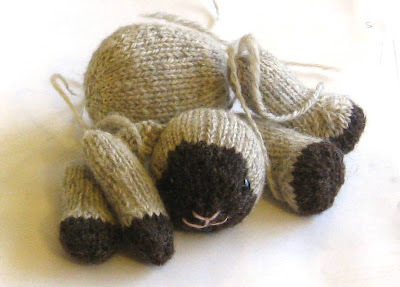 The Fuzzy Mitten Lamb has been the perfect project for the last few days. It takes up very little space and I can work on an arm or a leg while waiting in the van for the kids. I've got most of the parts completed. Just one more ear, and then I'll sew him up. I'm very pleased with the face. I used plastic safety eyes from 6060 on Etsy and some Knitpicks Palette in "Blush" for the face embroidery. Fun, Cute and Quick! I think I'll be making more of these.